Sickness and death from vaccine-preventable diseases has fallen to an all-time low in the U.S., according to researchers at the Centers for Disease Control and Prevention. Last year, there were no reported deaths in the U.S. from measles, diphtheria, mumps, polio, or rubella (German measles), according to research published this week in the Journal of the American Medical Association (JAMA). The number of deaths for tetanus, pertussis (whooping cough), and Hib disease (a major cause of meningitis) had all fallen more than 99% since vaccines were introduced against them. Vaccines have cut the number of deaths from hepatitis A, acute hepatitis B, and chickenpox by more than 80% each. And deaths from invasive pneumococcal disease (a cause of pneumonia, meningitis, and blood infection) have been cut by a quarter. Smallpox has been eradicated worldwide. Why, then, is there so much concern about vaccines? In the U.S., few health issues get people as riled up as the persistent, though almost completely discredited, argument that routine childhood immunizations cause autism. In the U.K., doctors and policy makers are debating whether to encourage universal vaccination against chickenpox, a step that U.S. medical authorities took in 1995. Even that debate  focused not on the vaccine's safety, but on whether it's really necessary  has become surprisingly bitter. Vaccines, like any drug, do carry some risk  but in healthy children, that risk is minute. A very small number of immunized children will have an allergic reaction to the vaccine, sometimes so severe it kills them. The trouble is that people are very bad at translating the practical danger from such miniscule statistical risks. Most people, given the choice to vaccinate their kids and run a tiny risk of an allergic reaction, or not to vaccinate their kids and  as in the case of polio  face a risk of contracting a crippling, sometimes lethal disease, can't figure out what to do: So, they'll ask a doctor. And doctors know that most people can't assess the risks clearly, which is why they get frustrated when a parent refuses to vaccinate a child. The JAMA authors note their study is not a cost-benefit analysis of any of the vaccines that it analyzes. But the figures do put immunization debates in perspective. "Vaccines," the authors write, "are one of the greatest achievements of biomedical science and public health." The authors cite a 2001 paper, estimating that every year, seven of the 12 routine childhood vaccinations given in the U.S. prevent 14 million disease cases and 33,000 deaths. The JAMA authors believe their own death-rate reduction figures may in fact underestimate the true benefits of vaccination. The numbers don't account for chronic disease averted because of a prevented infection: Hepatitis B, for example, is a major risk factor for liver cancer. The potential gains of vaccination aren't limited to infants and children, say the CDC researchers. Adults can ask their doctors whether they're good candidates for immunization against shingles, meningococcal illnesses, the human papillomavirus (a cause of cervical cancer in women), and, of course, the flu, among other diseases. 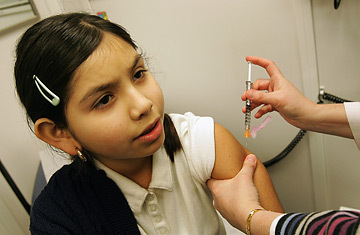 "By improving vaccine coverage to adolescents and adults, there could be much greater public health benefit," says co-author Sandra Roush.